During the course of her day-to-day investigative research, Lara comes across some 'clues' referring to a small island in the Bering Sea - Melnikov Island; a faded photograph shows an Inuit whale-hunter holding what looks like an ancient Golden Mask; an old newspaper from 1945 mentions a conflict over an Alaskan gold discovery; and a secret blueprint in Russian outlines some kind of fortified military minebase. Locked into the idea of uncovering the Mask, Lara discovers that it might be the long-lost Golden Mask of Tornarsuk - a 'Greater Spirit', said to bestow powers of re-animation on the mask holder. Join Lara in 4+1 dramatic new levels, in the final world of Tomb Raider 2. Help her explore an abandoned mine complex in Alaska and discover a strange and hidden world. Many more surprises await as Lara uncovers the secret of the Golden Mask. Explore 23 exciting, action-packed levels in all. 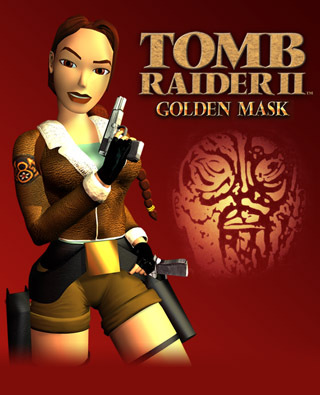 Featuring an enhanced Lara Croft, complete with costume changes, Tomb Raider 2 combines the classic gameplay of the original with an array of improved features including: enhanced engine, dynamic lighting, exterior settings, new moves, new weapons and a plot that'll have Lara twisting and turning around every corner.